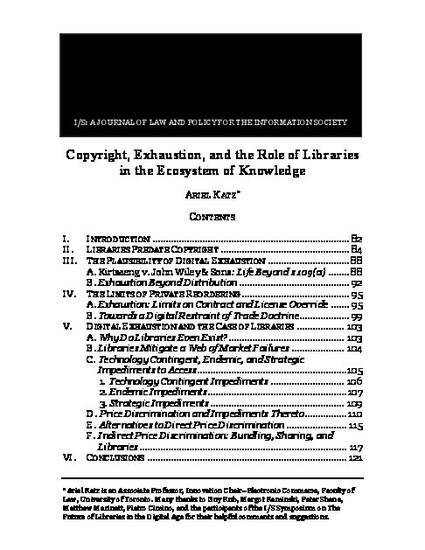 In this Article, written for a symposium on the future of libraries in the digital age, I present and challenge two common views about the scope of the first-sale doctrine, or exhaustion: namely, that the doctrine applies only to the transfer of tangible copies of works but not to the transfer of digital files, and that copyright owners can circumvent exhaustion by characterizing transactions as “licenses” rather than “sales”, or by contracting out of it. The law on digital exhaustion is anything but settled. As codified, the “first sale” doctrine it may limit only the distribution right, but its statutory presence might merely affirm a broader principle of exhaustion—one of the several principles in copyright law that limit the copyright owner’s powers. The principle of exhaustion can apply, and at times has been applied, beyond the distribution right. Likewise, the notion that copyright owners can circumvention exhaustion by characterizing transactions as “licenses” rather than “sales”, or by using contracts to exercise downstream control is hardly a foregone conclusion. Established precedent and sound legal principle indicate that while the law recognizes some scope for contracting around exhaustion, courts will not necessarily uphold any private reordering of the respective legal entitlements of copyright owners and users. While these observations and conclusions apply to exhaustion generally, they apply most demonstrably in the case of libraries. Libraries occupy a privileged space in the copyright system. Historically, libraries predate copyright, and the institutional role of libraries and institutions of higher learning in the “promotion of science” and the “encouragement of learning” was acknowledged before legislators decided to grant authors exclusive rights in their writings. The historical precedence of libraries and the legal recognition of their public function cannot determine every contemporary copyright question, but this historical fact is not devoid of legal consequence. History is part of the legislative history of statutes, and it constitutes part of the context that informs the interpretation of current statutes. Therefore, if not false, then the view that the current legislation does not allow digital exhaustion is at least questionable.